An escaped wallaby has been caught by police in a garden in Wiltshire. 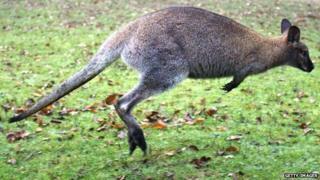 Officers were called to reports of a kangaroo on the loose in Elcot Lane in Marlborough at 23:00 BST on Wednesday. Brian Williams, who called the police, said he had had a couple of pints but could not believe his eyes when he saw "this thing" coming along the lane towards him at "great speed". It was herded by police into a garden, where it spent the night, and is due to be collected by its owner later. Mr Williams said he was walking back from Marlborough Football Club when he was surprised by the animal hopping "at great speed along the lane". "When I told my wife what I'd seen she burst into hysterics and suggested that I'd had more than two pints," he said. The animal - the size of a family dog - was also spotted sitting in the middle of the road by Lee Oades, who was out walking his dog. "It was completely dark and as we got closer and shone the torch at it, it turned, looked at us and bounced off down the road," he said. "It was absolutely bizarre, my dog was going mental because he wanted to go after it." The wallaby, which is believed to have escaped from a farm three miles away, was chased by police officers and eventually herded into a nearby garden.